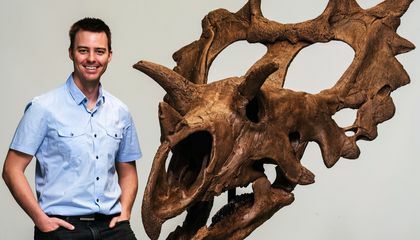 A novice fossil collector's lucky find in a remote Montana badlands more than a decade ago has turned out to be a new kind of spectacularly-horned dinosaur, researchers have announced. 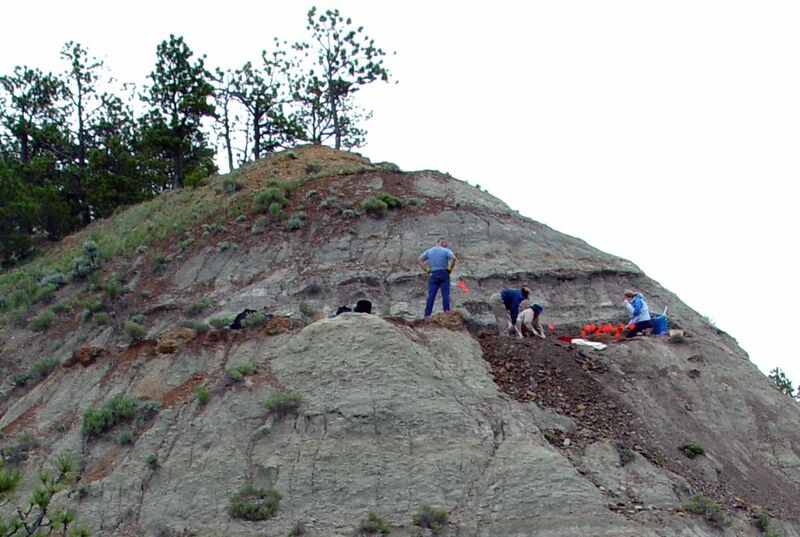 The bones unearthed near Winifred, Montana, represent a previously unknown species of dinosaur that lived 76 million years ago. Its scientific name is Spiclypeus shipporum (spi-CLIP-ee-us ship-OR-um) but it's been nicknamed "Judith," after the Judith River rock formation where it was found in 2005 by retired nuclear physicist Bill Shipp. Canadian Museum of Nature paleontologist Jordan Mallon says Judith is closely related to the well-known Triceratops. Both had horned faces and elaborate head frills, although Judith's horns stick out sideway instead of over the eyes. Like Triceratops, Judith was a plant-eater, approximately 15 feet long and weighing up to four tons, Mallon said. Shipp told The Associated Press that he stumbled across what turned out to be Judith's femur bone in 2005. He had hired an amateur paleontologist to give him an introduction to fossil hunting on a ranch Shipp owned near the Upper Missouri River Breaks National Monument. As Shipp worked his way around an eroded rocky outcropping on the property, he saw a piece of bone sticking several inches out of the ground. "I found it accidentally on purpose," Shipp said. "I was actually looking for dinosaur bones, but with no expectation of actually finding any." After recovering six bones during an initial dig, Shipp brought in a team the next summer that spent two years excavating and cleaning the bones. They ended up with half of Judith's skull and parts of its legs, hips and backbone. It wasn't until last year, after the bones were acquired by the Canadian Museum of Nature, that Mallon formally identified them as belonging to a new genus and species of dinosaur. Judith was at least 10 years old when it died. An examination of its bones by Edward Iuliano, a radiologist at Kadlec Regional Medical Center in Richland, Washington, revealed evidence of a severe leg infection that would have left the animal hobbled. The injury made Judith potentially vulnerable to Tyrannosaurus rex-like predators that lived around the same period, Mallon said. "It's an exciting story, because it's a new species, and yet we have this sort of pathetic individual that suffered throughout its lifetime," Mallon said. "If you're hobbling along on three limbs, you're probably not going to be able to keep up with the herd." Details on the find were published in the online scientific journal PLOS ONE. A public exhibit featuring a reconstruction of Judith's skull and other bones from the find on Bill Shipp's ranch opens May 24 at the Canadian Museum of Nature in Ottawa. Fewer than a dozen dinosaur species have been discovered in the Judith formation despite more than a century of exploration in the area, said John Scannella, manager of paleontology collections at the Museum of the Rockies in Bozeman, Montana. "This new animal provides another piece in the puzzle of our view of what the ecosystem of central Montana 76 million years ago was like," Scannella said. "It really is our first glimpse of a whole new animal that we weren't aware of. That's inherently cool." Why is it unusual for a first-time fossil hunter to find a dinosaur? Really interesting and cool. I find it strange that this species of dinosaur hasn't been discovered before, if we've been searching around that area for years upon years. It's unusual for a first-time fossil hunter to find a dinosaur because some paleontologists spend their whole career looking for dinosaurs, yet they might end their career without ever finding one. The way the world is able to preserve the past underneath our feet is pretty amazing. In my opinion it is really impressing finding a new species of dinosaur. It tells us so much about the past and about the future too. It is another part of the puzzle, to find out what our ecosystem was 76 million years ago like. I knew that it is so difficult to find a new species of dinosaur, but I never thought about how long it take also to clean the bone and take it in a museum. It is also really amazing, that you know so much about this dinosaur, just with analyzing his bones! In my opinion it is really interesting to be a fossil collector, even when it takes you so long to discover something, it have to be an amazing feeling when you finally discovered something totally new!